The social and email marketing channels are increasingly intertwined. 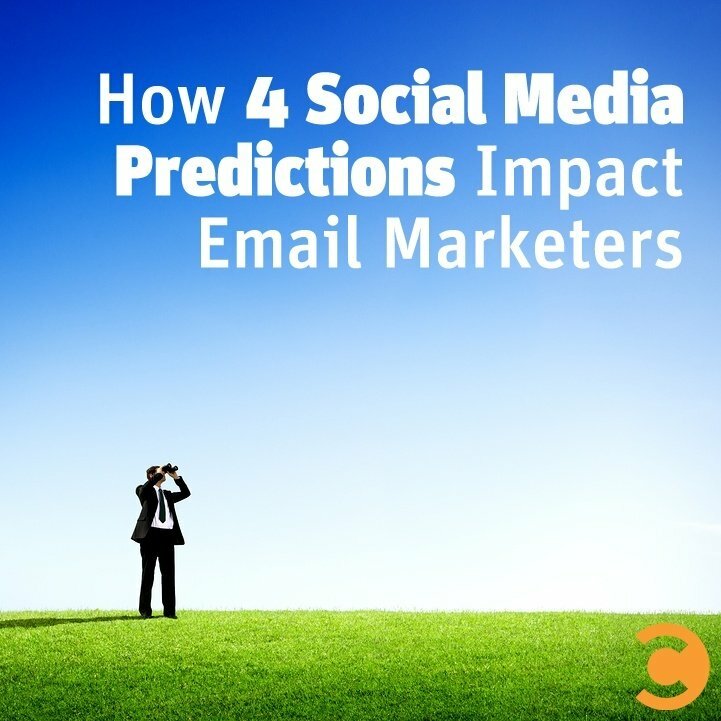 So when I read this great collection of 30+ Social Media Predictions for 2015, it immediately had me thinking about how they affect email marketers. One-to-one messaging has always been a key strength of email, and in recent years it has only gotten easier to use personalization, dynamic content, predictive intelligence, segmentation, and triggered emails to send the right content to the right person at the right time. And that’s very fortunate, because with per-subscriber email volume continuing to rise every year, subscribers’ expectations are rising as well. They expect more relevant messaging and respond positively when they get it—whether the message is targeted based on time of open, country of origin, what the subscriber left in their shopping cart, power consumption, lack of email engagement, lack of mobile app engagement, or any number of other behaviors or preferences. Emails that contain one-to-one content or are delivered on a one-to-one basis represent an increasing contribution to email marketing revenue, while “one size fits all” broadcast emails are contributing less and less as people tune out irrelevant and impersonal messages. Siloed messaging is dying. Omni-channel messaging is the goal now because consumers are omni-channel. That means starting with the message or content and propagating it outward in a way that plays to each channel’s strengths. The social media landscape is certainly shifting. Social media advertising is becoming more powerful because of its highly sophisticated targeting, while social media publishing is becoming weaker because the organic reach of social content is declining. The latter highlights the risks associated with leased media activities. Choosing the right activities for the right channels is critical. It seems increasingly clear that social media is not the best place for concerted efforts to build an audience or to host long-tail content. Building an audience on more stable granted media like email marketing and hosting long shelf-life content on owned media like your website or blog is wiser at this point. Reading email is the number 1 smartphone activity and, according to Salesforce’s 2015 State of Marketing report, 31% of marketers say their emails are read on a mobile device more than 50% of the time, up from 24% last year. However, brands have been slow to move to a mobile-friendly strategy. At the end of November, just 51% of the more than 150 B2C brands that I track were using either mobile-aware design (single-column layout with large text, images, and buttons) or responsive email design. That was up just one percentage point from early October—and during those eight weeks the percentage of brands using responsive design actually fell. Going into the heart of the holiday season, that’s shocking. It’s time to get serious about mobile. Enough brands are getting it right at this point that it makes everyone else look unprofessional—which is going to make consumers even more punitive toward mobile-unfriendly marketers than they already are. Also, it has now become clear that the gap in e-commerce conversions and m-commerce conversions isn’t a form-factor issue or consumer education issue: It is a design issue. When you design mobile-friendly emails, websites, and mobile apps, this gap can disappear completely. All in all, 2015 is an evolutionary year, not a revolutionary one. Most of these trends have been developing over the past year or two, or three, so none are a big surprise. But each of these trends has developed to the point where the leaders are reaping a substantial competitive advantage over the late adopters. So if you haven’t been leading, 2015 is the year to catch up. Chad is the Research Director at Litmus and the author of Email Marketing Rules and thousands of articles and posts about email marketing. His research and commentary have appeared in more than 100 publications, including The New York Times, The Wall Street Journal, USA Today, Advertising Age, Adweek, Fortune, and MarketWatch.